The silver screen (and all its denizens) may hold court here in Hollywood, but don’t knock its close cousin: TV. Television is no lightweight, and has its own special place in everybody’s homes. 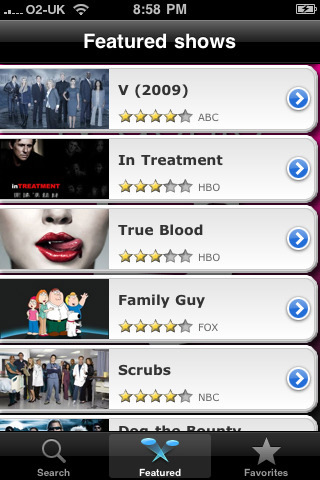 And to bring you all information pertaining to TV is Shout Digital’s TV Genie, an iPhone app powered by the TVDB API. The default screen upon launch is under the Search tab. Type in the name of the TV show or actor you’re looking for, and the database will give you a list of TV shows you might be looking for. When you tap on a show, the app will bring up a short synopsis, episode ratings, the cast list, and season guides; you can also add the show to your Favorites list or be directed to the show’s Amazon page from here. Tapping on Cast List will bring up all the actors and actresses, along with a profile picture (if available). If you choose one, you will be shown their profile picture in full and can find out what other TV shows they’ve been in. The season guides will give you an episode breakdown of each season. Details include synopsis, air date, episode rating, and a chance to buy the episode from Amazon. Not only are the episodes listed, but there is also a Specials section (if applicable) for all the behind-the-scenes clips, unaired episodes, commentaries, and general goodies that accompany the regular series but aren’t in the episodes themselves. The Featured tab will host an array of TV shows that are currently popular. TV Genie is like a distilled version of IMDb (the Internet Movie Database): it still has all the most important information, but only pertaining to TV and without all the extra details such as actor biographies, trivia, filming locations, etc. I would actually love to have all those extra details (you never know when it might come in handy), but they aren’t included in the TVDB website anyway–it links you to IMDb for that. As it is, TV Genie is very user-friend and easy to navigate–there’s only so much you can look up–with an excellent sense of aesthetics. The only minor issue is that it lags sometimes, but as it is pulling information through an internet connection, it’s entirely forgivable. Use this app if you want the bare minimum of information about a TV show, but for more than that you should probably turn to the internet. AppSafari review of TV Genie was written by Julie Guan on May 13th, 2010 and categorized under App Store, Reference, TV. Page viewed 4172 times, 1 so far today. Need help on using these apps? Please read the Help Page.